This is a beautiful Pair of Sterling Silver Mixed white pearl Drop Earrings by Kyoto Pearl. Genuine Pearls. Fine Sterling Silver set with stunning iridescent Gilson Opal in vibrant Fire Red/Orange/Green colours. 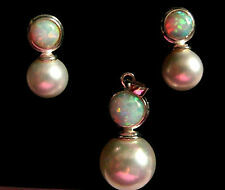 ~ More Gilson Opal Jewellery designs and other colour gemstone designs also available. "Natasha Rose Jewellery". Set with stunning iridescent Gilson Opal in vibrant Fire Red/Orange/Green colours & Pearl. Sterling Silver Pendant & Matching Stud Earrings set. "Natasha Rose Jewellery". Sterling Silver - Stamped "925" on reverse and also on butterfly backs. This is a beautiful Mixed white pearl bracelet by Kyoto Pearl. Genuine Pearls. Genuine Pearls, Lapis Lazuli and Rock Crystal beads with 9ct gold spacers set. The bracelet is 18cm or 7" long. STUNNING and super unique Millennium Hallmarked Silver & Freshwater Pearl Necklace & Earrings B'gham 2000. Year: 2000. In its jewellers presentation box this fine quality jewellery item will look beautiful. LADIES 3.5cm MOTHER OF PEARL PENDANT CROSS. Sterling Silver Mother of Pearl Cross Pendant Necklace and Chain. London Silversmiths British Made Gift Boxed. 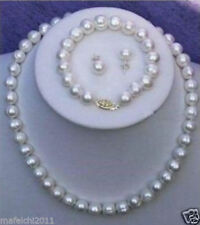 Beautiful Gold Plated NEWQUAY PEARLS Necklace & Earrings Set. Boxed. Lovely pendant and earring set from Newquay Pearl. 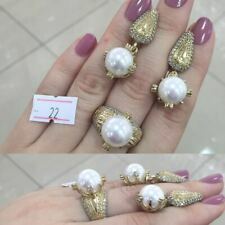 Gold plated, with real pearls and sparkling stones. Sterling Silver Mother of Pearl Earrings and Pendant Set with 17' Triple Ivory Leather Cord Necklace. 92.5 Sterling Silver, Leather Cord and Shell. Earring size (approx) Earring back finding Cord / Chain size (approx.). 9K White Gold. Pearl Diamond Pendant. Pearl Earrings. Fresh Water Pearl. Pearl - 0.18g. Pearl - 0.15g. (Price excludes chain). "Natasha Rose Jewellery". - A wide range of Quality Fine Sterling Silver and Gemstone Jewellery. Fan shape to the top joined to circle with fan shape to bottom. Sterling Silver Pendant & Matching Drop/Dangle Earrings Set. A BEAUTIFUL SET WHICH CONSISTS RING, EARRINGS, PENDANT AND CHAIN. EACH PIECE HAS A PRETTY MINT FRESHWATER CULTURED PEARL. THE PENDANT IS ON A 14" CHAIN. EARRINGS ARE STUD FOR PIERCE EARS ONLY. WOULD MAKE A LOVELY PRESENT. Kyoto Pearl Drop Earrings. 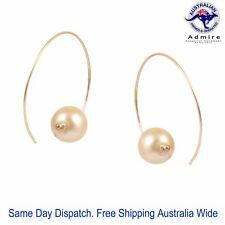 Genuine Pearls - any one who loves pearls will love these earrings - both different / one of a kind. New In Box. 925 is stamped on the necklace chain and clasp, and also on each earring fastening (see photos). Each cat is 2.5cm (1") in length. The total length of the necklace (including clasp) is 42.5cm (16") and the drop of each earring (including cat) is 8.5cm (3.25"). Sterling Silver 18" Chain&cross+pink Pearl hand Rosary. • Jewellery Type: Earrings, Necklace. • Fine or Fashion: Fine. a. Don't put the jewellery in high temperature or direct sunlight. c. Don't wear different jewellery together. THIS GORGEOUS ECUADORIAN HAND CRAFTED EARRING AND CHOKER SET HAS A PRETTY GREAMY PALE YELLOW COLOURED MOTHER OF PEARL SET IN 925 STERLING SILVER. THE FLEXIBLE CHOKER HAS A SLIGHT STRIPED SATIN FINISH. A perfect classic, yet modern set of fantastic quality, with real natural pearls and diamonds - suitable for any age! You will find this set is used again and again! White Pearls & Diamonds Set - Fantastic Quality. FOR SALE WE HAVE A LOVELY LOOKING 9CT YELLOW GOLD PEARL, RUBY & DIAMOND NECKLACE. PEARL - 3 X PEARLS. LOW STARTING PRICE! Pendant - overall size 32 mm x 8mm including bale. Item is pendant only. This is a beautiful sterling silver Mother of Pearl double teardrop pendant necklace and dangle earrings set. Rolo chain necklace 46 cm. Teardrop pendant and earrings height 17 mm, width 10 mm. Silver spring clasp and French hook back. Rhodium plated to enhance the natural colour! Pearl Information Stone Shape: Drop. Stone Shape: Round. Stone Size: 6x4mm. Natural/Created: Natural Mined Stone. Stone Size: 2x 2.00mm | 2x 1.70mm. Stone Size: 8x6mm. Sterling Silver 18" Chain&cross+blue Pearl hand Rosary. 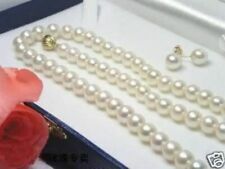 High quality cream freshwater rice pearls which vary between 6mm-8mm approx. in length. Overall earring drop length approx.925 Sterling Silver BLUE LACE AGATE Gemstone Heart and CREAM FRESHWATER PEARL. Pendant and earrings set with freshwater pearls cast in solid yellow gold. British made and hallmarked. Supplied with an 18" / 46cm yellow gold curb chain. British made and hallmarked. If you are looking for a classic pearl set look no further. Supplied with an 18" / 46cm yellow gold curb chain. Crafted from 925 sterling silver, these exquisite drop earrings dangle beautifully and feature a delicate pearl above a floral design. It has been found in fossils dating back 270 million years. Etched with linear decoration, the Ginkgo's leaves are an unfurled fan shape. Sterling Silver Leaf Shape Mother of Pearl Earrings and Pendant Set with 17' Brown Triple Leather Cord Necklace Set. Earring size (approx) Earring back finding Silver Spring Ring Clasp. Pendant size (approx.). A classic pair of drop earrings, crafted from 9ct white gold, featuring two freshwater pearls. A classic single stone pendant, crafted from 9ct white gold, featuring a freshwater pearl. Pearl Information. MAIN STONE GEMSTONE : PEARL. TOTAL WEIGHT 110.00 CT (TOTAL WEIGHT OF SILVER STONE) 22.00 gr. 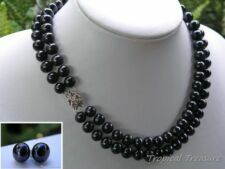 This is a genuine grey ming pearl necklace and earring set. The pearls are all natural and have been hand strung with triple high quality silk thread and knotted between each pearl. The fastening is a very secure foldover clasp fully hallmarked for 925 sterling silver. One set///Stunning colour lavender ice real shell pearls,,925 stamped sterling silver plt 18"approx chain ssf with lavender ice coloured shell pearls on a sil plt leaf bail 925 stamped hooks earings to match/chain may differ///see my other items. p&p ,were applied,none returnable/ no return,no refund, buyer pays all postage costs. 2-Row Lavender Pearl Necklace Bracelet Earrings 18"
4 pcs biwa freshwater pearls genuine pearl pendant gem stone 17"